You don't have a Nexus S 4G, or Sprint or the Citi Mastercard required for Google Wallet. But that doesn't you mean you don't wanna live in the future, using your phone to pay for stuff. Here's how to do that right now, no matter what phone you've got. What Is It? : PayPal's app allows you to send a friend money by bumping phones and set the amount, split the dinner bill, pay for items and retailers (physical and online), score deals, and even deposit checks. What's Bad: If you're sending/receiving money from someone—not a business—using debit/credit card there is a $0.30 + 2.9 percent fee (though you decide who pays it). Merchants are always charged a fee. PayPal's solutions are somewhat convoluted: The ability to split a bill with friends is an interesting concept, but it's certainly not simpler than tradition methods. The local deals it offers are not nearly as good as other deals services ("2-for-1 name tattoos," I kid you not). Verdict:It has potential, but it's more complicated than some of the other solutions. While the ability to pay without any credit card or phone is fantastic for emergencies, in most cases, a phone tap is just much easier. It will be interesting to see how many merchants will accept this as an option. As of right now, though, the app is very handy for passing money between friends, since almost everybody has a PayPal account. What Is It? :American Express' solution is somewhat similar to PayPal's, in that it provides a third-party account that you can "charge up" with a bank account, debit card, or credit card, and offers a solution for peer to peer money exchanges. What's Good:It's a pretty easy way to send money from your friends, and there are tons of options for charging the account. You'll also be able to use Serve to get money from an ATM. One of the unique features is that you can set up sub-accounts that other people can access at your discretion, for "everything from children's allowances to dog walker fees." What's Bad: How many of your friends are on Serve vs. on PayPal? Yeah, not many. While there are no fees now, after January 1st, 2012 every time you add money to your Serve account you'll be charged 2.9 percent + $0.30, and it's $2.00 per ATM withdrawal (though you do get one freebie each month). It's also not quite clear what their plan is for playing at regular merchants. Is it done with the app? Through a card? Why is it so unclear? Verdict:It's more expensive and has fewer options and less reach than the best competitors. Unless you really want to set up your kid's allowance this way (so you can track it, like a jerk) then there's no compelling reason to go this route. What Is It? : While the others focus more on paying, Square focuses on getting paid (though they do have an app called Card Case that lets you pay Square merchants without using a credit card). Essentially, it's a tool for small businesses and individuals that allows them to easily accept credit card payments using their phones. What's Good: It's incredibly simple. With a Square account you are provided with a small dongle for your phone that allows you to swipe credit cards. It accepts Visa, Mastercard, Discover, and American Express, and you're charged the same amount for every swipe, regardless of what kind of card it is. It also make keeping records extremely easy, and it's paperless. The geotagged email receipts are beautiful. Whoever's paying doesn't need an account to pay money—just a credit or debit card, which everybody has. What's Bad: It's 2.75% per swipe, or 3.5% + 15¢ if you enter the card number manually. It's not for paying, just getting paid (which isn't really a bad thing, per se, as this is more for small businesses). As of right now it only supports iOS and Android. Verdict: I've seen merchants at flea markets and such use this and swear by it. Allowing a little guy to accept credit cards like a big guy is a huge boon. 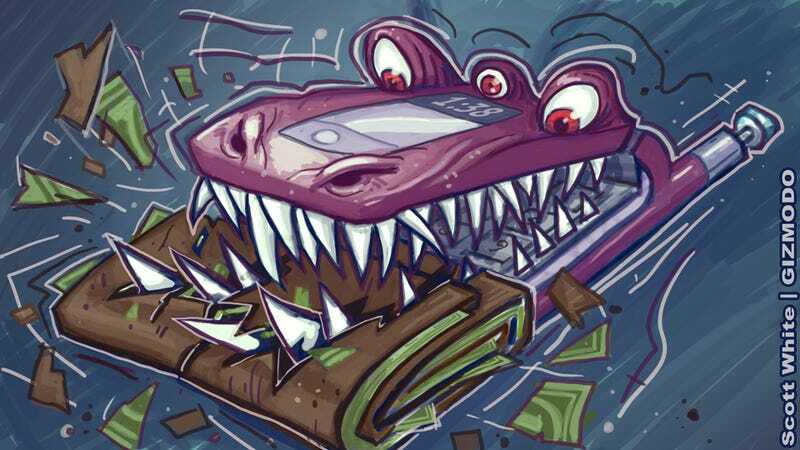 It relies on credit cards which is good because they're ubiquitous right now, but as you may have noticed from this article, we maybe be moving away from them. That said, if NFC catches on it wouldn't be hard for Square to integrate it. What Is It? : Visa Mobile and its Digital Wallet promise the moon and the stars. Location-aware offers, mobile to mobile payments, pay via any point-of-sale, NFC, and a bag of wood-nymphs to tickle your nether bits. Okay, maybe not the wood-nymphs... yet. What's Good:If Visa actually pulls off everything it's been claiming it's going to do, it will be very good, and may even be able to compete with Google Wallet, as it looks like it will offer most of the same stuff. What's Bad: Well, it doesn't exist. That's pretty bad. It's probably going to launch, sometime soon, but for now the only form it has is a somewhat half-baked iOS app, which is essentially yet another offers program. Verdict: It's supposedly coming this fall, so we shouldn't have to wait long to see if this measures up. What Is It? : It will allow you to pay at any participating merchant with your phone. It won't use NFC and won't require the merchant to add any hardware or software. No bar codes, either. So, it works, how? Not at all clear, but they claim to allow for rewards, offers, check-in, and all sorts of goodies. It draws money from whatever bank/credit/debit account you want and doesn't give the merchant any of those account numbers for added security. What's Good: If they can actually make it easy for any merchant to use without installing anything, I mean, I guess that would be good? Won't require NFC? I mean, I guess there will be people who don't want it, maybe? What's Bad: Well, again, this one doesn't exist. It's making huge promises for a company that no one's heard of. Can't sign up for anything yet. There's a page for merchants to sign up, but have any? Who knows. Also, if your phone runs out of battery then you won't be able to pay for anything. Verdict: Again, we'll have to wait and see on this one. No word one when it will launch or for what phones, or with which merchants. It may simply disappear after the big guys start going full-tilt. What Is It? : Venmo is for peer-to-peer payments. Paying your buddies back, sending your roommate money for rent, stuff like that. It's simple and it links to your bank accounts and credit cards. Payments received are direct deposited into your bank account. What's Good: It's completely free—there's no transaction cost at all, for individuals. That's a real advantage over PayPal, which is the closest competitor in this space. Venmo says it will eventually make money off of business transactions. Money you receive is automatically directly deposited into your bank account. You can use the app, which is fantastic, or pay/charge anybody using just their phone number—no Venmo app required. What's Bad: It's not exactly speedy. When you receive money, it may stay in your Venmo account for up to two weeks before it's dumped into your bank account. Venmo is likely earning a little money off of the interest, but if you want you can manually dump the money into your account whenever you want, basically instantly. Correction: this is no longer the case. Venmo has partnered with Wells Fargo and now gets your cash into your back account overnight, which basically makes it the fastest peer-to-peer service out there. Nicely done. Verdict: Other than the aforementioned slowness of the direct deposit (unless you DIY), it's a pretty solid way to pay someone back or get paid back. It's definitely not a wallet replacement since you can't pay merchants or bills (yet), but it works fine for what it is. Availability: Super limited right now—only for the Nexus S 4G. More coming soon. What Is It? : This is Google's vision for being a total payment solution. Works with Google Offers, it's usable where ever Mastercard's PayPass is accepted (and more coming with integration from Visa, AE, Discover, and the ISIS NFC network), and it's pretty simple. You just enter your PIN, tap your phone, and you should be good to go. What's Good: Google + Mastercard (+ the other partners which will be integrated soon) = a ton of reach. It's already accepted a fair amount of places (major pharmacies, taxis, etc) and many more will be coming soon as NFC become more widespread. If you have a Citi Mastercard you can have Google Wallet charge it directly. If not, you can charge a Google Card with whatever method you like. Oh, and it's all totally free. What's Bad: Well, to say it ain't widely available would be like to say that pandas are a little bit bad at breeding. This will change, but right now unless you have a Nexus S 4G on Sprint, you're out of luck. Also, with the current NFC technology in that phone, if the battery dies, then you're out of luck (this, too, is likely to change). Verdict: It's probably going to be really, really awesome. At some point. Eventually. Maybe sooner than later. But not 'till more phones and merchants have NFC. can see his work here and follow him on Tumblr, Facebook and Twitter.